Yes, it is a rerun, but this is what I am baking for my daddy. It is delicious stuff! Volleyball season kicks off which means lots of travel, packing healthy, yummy, convenient food and endless hours in the gym. I am so excited! After 6 years of this, I am a bit of a pro, and there are a few things I always bring. Popcorn, popped in my Whirly Pop, plain or kettle, it is the best snack for on the road. Good for the digestive system! Banana Bread, I have blogged many times about my banana bread. The recipe is here and it never fails to please. It is low fat, or at least it was until I added the chocolate chips, and it stays very moist. I like to bake it and freeze it well wrapped in foil and then cut down the middle and then slices, so the pieces are a little smaller and more manageable. So I poked around my freezer for bananas and was disappointed to only find three black ones. That's just one loaf, so what else am I going to bake? The oat bran bread was already in the oven, but I didn't think that would go over well with 16 yr old girls. And, by the way, I added a cup of freshly grated carrots to the oat bran bread, what a great addition! A little more crunch, and it got me thinking about all the other possibilities. Then I rummaged around the pantry and found a can of pumpkin leftover from the fall. Hmmm, I perused my tub file for a pumpkin bread recipe, because I usually make pumpkin muffins and I was out of chocolate chips, so I needed something different. I found one that was cut from Southern Living, no idea what year, but the little blurb next to a picture that is cut off reads Brother Boniface bakes daily at Mepkin Abbey in Charleston, South Carolina. It is common for persons in religious orders to take the name of a Saint. Sadly I cut the picture off and when I went to the website of Mepkin Abbey I didn't see a Brother Boniface in the photo, nor any mention of a bakery. However, these entrepreneurial monks are mushroom farmers, and sell them at local stores and even have a few recipes on their website. Isn't the internet amazing!? Now a little aside about St. Boniface. It is the name of my childhood church in Clinton, Iowa and is very dear to my heart. I made my first communion there and spent many Holy Days of Obligation there. It is a gem in a very unassuming place. St. Boniface was the Patron Saint of Germans and is recognized as bringing Christianity to the German's when he cut down the Oak Tree of Thor and dared the mighty Thor to stop him. A big wind came and blew the tree down and the people were drawn to the power of God. He died in 754, so the legend was passed. Clinton, Iowa was a very German community, and the church of St. Boniface is thankfully well preserved. So it was decided I would make Brother Boniface's Pumpkin Bread. I liked the looks of the recipe, lots of spices, a whole can of pumpkin (because what can you really do with a ⅓ of a can of pumpkin in the fridge?). I altered it with walnuts instead of pecans, I used King Arthur's White Whole Wheat Flour and I used buttermilk instead of water. The bonus, it makes 2 big loaves and it's delicious! Now it isn't lowfat, low in sugar or anything like that, but dang, it is moist and satisfying! So, get in there and Bake! Beat first 14 ingredients at medium speed with a mixer until moistened. Fold in nuts and pour into greased loaf pans. Bake at 350° for an hour or until toothpick comes out clean. Cool 10 minutes in pans and turn onto a rack to finish cooling. So, what are ya waiting for? Get in there and Bake! Ah, the Greek Life. When I went off to college in 1982, I decided to rush. Some lady called my mom and said I would need to go to this afternoon tea party and meet the nice sorority alumnae in our area, I did, they all wrote me a rec and I got my first choice, Chi Omega. Those were the days. I think the fact that I was oblivious helped out a lot. I had no expectations, I had no airs about me or inflated ideas of my family's wealth or standing. I wasn't raised that way. I wanted to be in a sorority because I was 16 hours from home and knew NO ONE at the University of Colorado. After one week of skits, warm iced tea (there's a good oxymoron), countless interviews and lots of singing, I was a pledge with a couple of hundred sisters. I learned the Greek Alphabet, the mythology stories about Persephone and the pomegranate seed, the rituals, the handshake and tolerance of all those girls! At the start of my Junior year of college, I had transferred to the University of Iowa. I tried out Chi O there, and the truth is, I was not a fit. No big deal, at that point I was focused on graduating on time (what was I thinking). So fast forward to present. My son left the biggest fraternity, the U.S. military, for University and my daughter to a nice, small liberal arts school. As the year got underway, I started hearing the rush stories. Friends of my kids at large state schools in sorority rush with nearly 2,000 girls. Valedictorians and Salutatorians not getting bids, girls getting dirty rushed and not getting into any house, and girls crying and stressing over which house is for them, only to get cut. What is this? My son went through rush, probably the oldest one at 21, and found a great house, great guys and it made his transition much easier. His nickname is Gramps, and he is the happiest he's been in a long time! He is a Lambda Chi just like his dad. And my daughter, well, she stressed over the whole deal as well, she knew that being a Chi O would be cool since her mom was one, but in her heart of hearts she wanted to be a Phi Mu. So Phi Mu it was. As soon as I got the message, another mom and I went to the Greek store and I discovered the colors were rose and white, that it is the second oldest fraternity in the U.S. and the lion is their little mascot. So, after spending a fair amount of cash on note pads, cups, key rings, pens etc., there was only one thing left to do. BAKE! How fun this was, and I can hardly wait for my friends to call me for Greek Cookies. 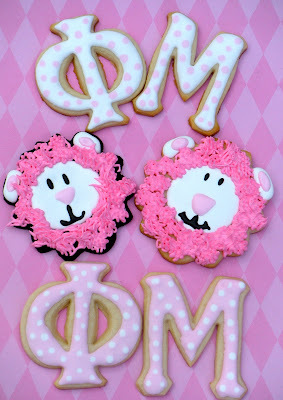 So many sorority events, I am happy to be the Phi Mu baker for the next 4 years! So what are you waiting for? Call me! I love it when things come full circle. About 5 years ago, an associate at WS had her just graduated (college) daughter come to work part time for the holidays. It was so fun to get to know her, she went to the same high school that my daughter was just entering, and her life was unfolding, an exciting time. She moved off to Houston after the holidays and got married. Christina and I helped out with some babies at the wedding so the parents could enjoy the ceremony without hiring a babysitter in a hotel room. And then last summer, I made baby shower cookies. So you can imagine my delight when she emailed me and said they were having a 1st birthday party and she wanted cookies! Full circle. She had her invites done at Tiny Prints which is an adorable site that I chose for graduation announcements. Wonderful company to work with. She wanted the cookies in the color scheme of the invites which were in the pink family. We decided on little pink and white birthday cakes for half of the favors, and then the #1 and a monogram in the others. I actually decided the monogram one. The set of numbers I ordered turned out to be pretty tiny. And personally if I am going to eat a cookie, it better be a good size. My dilemma with the dang numbers came with a Third Birthday I did this summer, and I really wanted a rounded three. This was what I got. Little. So I added party hats to her 3's. The little L monogram worked well for baby Leighton's party. She has some stickers to seal up the bags, so I never saw the completed packages, but it seems everyone was happy. 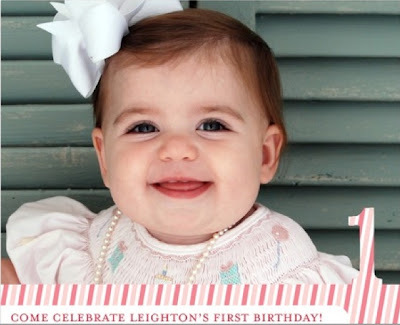 Especially little Leighton, how wonderful to have a 1 year old! So what a busy fall! After the kids left, I had to get the place into selling shape. I have been traveling to volleyball games, I had 25 hungry volleyballers and a few parents for dinner (can't believe I didn't take pictures) and now I am preparing to have the last garage sale of my life. Honest. I have done it once, and getting ready to move, I am doing it one last time. I am NOT moving all this stuff! But tucked between work and play, I have done a little baking. My friend Amy had an engagement party and wanted the muted colors of fall. She asked for flowers, and I love the rustic look of these. The sparkle makes them fun, but the subdued colors are very pleasing to the eye. So feast your eyes, but trust me when I say they were tasty too! So, what are you waiting for? Get in there and bake! I've always wanted to be a member of a secret society! This group of bloggers has a fearless leader named Amanda and secret Bat Cave called the Secret Recipe Club. Every month we get a blog assignment. Our job is to hit this blog, take a look around, get to know the blogger and make something from their blog. But you never let them know. Until reveal day that is, then we blog hop and read all about our secret recipe adventures. There are a lot of us out there, so hop about and see what we all found. For September I was assigned a blog called Ground Cherry. I had to do a little Googling on a ground cherry as I had never heard nor seen one. They are indigenous to Central and South America and sound rather interesting. But no chance the little guys would grow in the violent heat of Memphis. The blog is all about sustainable cooking for one, and focuses on gluten free. Perfect! As a new empty nester, I am now cooking just for two, but it is way easier to make more than freeze leftovers. The recipes were light and fresh and focused on seasonal ingredients, although I am not sure where my new blogger friend is located. I decided to steer away from baking, because I seem to do an awful lot of that. I was looking for dinner, something light and quick. My first peek at a recipe was for a Mac and Cheese. Okay, I know, not light and usually not healthy. But doesn't everyone love a mac and cheese. I haven't made it in over a year and thought it might be a nice change. But Ground Cherry had made a recipe that was supposed to be a little healthier using pureed cauliflower and squash. He/she was not terrible happy with the results. I love it when a blogger is okay telling you that something is not great. I especially love it when they offer suggestions to make it better. I decided this was not the best choice for me. With my empty nest, "someone" seems to hover in the kitchen, and pureed vegetables in his mac and cheese would not go over well! A few weeks ago I blogged a yummy quick dinner I made of crab cakes and grilled salad. 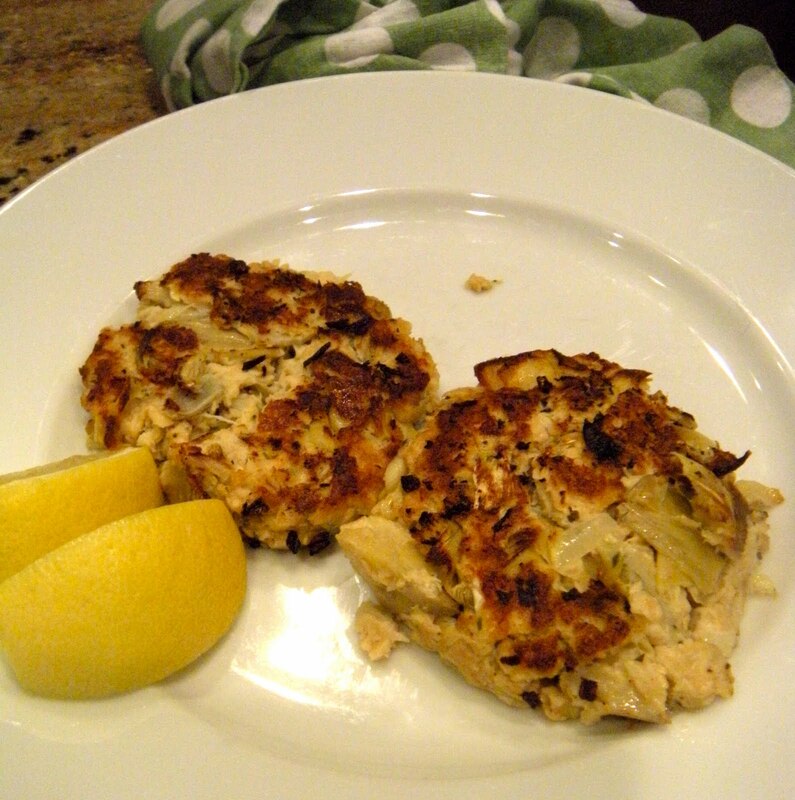 So when I found Ground Cherry's recipe for Salmon Artichoke Patties I knew I found dinner. What I loved was the simplicity of the ingredients and easy to prepare. My confession, however, is that I have never bought canned salmon. So a new adventure for me. The recipe is basically salmon, marinated artichoke hearts, oregano and egg, a little cornmeal to bind and mustard. I used a little dijon. The ingredients whipped up in minutes and my patties cooked in less than 5 minutes. I served it with a grilled salad and dinner was served. The patties are light and delicious. Scott asked for some chopped onion next time, he likes a little crunch. But here's the best part. Salmon is cheap and very low in calories, and high in Omega 3 which my hubby needs more of! Perfect. I squeezed a little lemon on my patties, Scott likes a little tartar sauce (he's a dunker). I peruse a number of blog regularly (see the list), and hopscotch about from there. 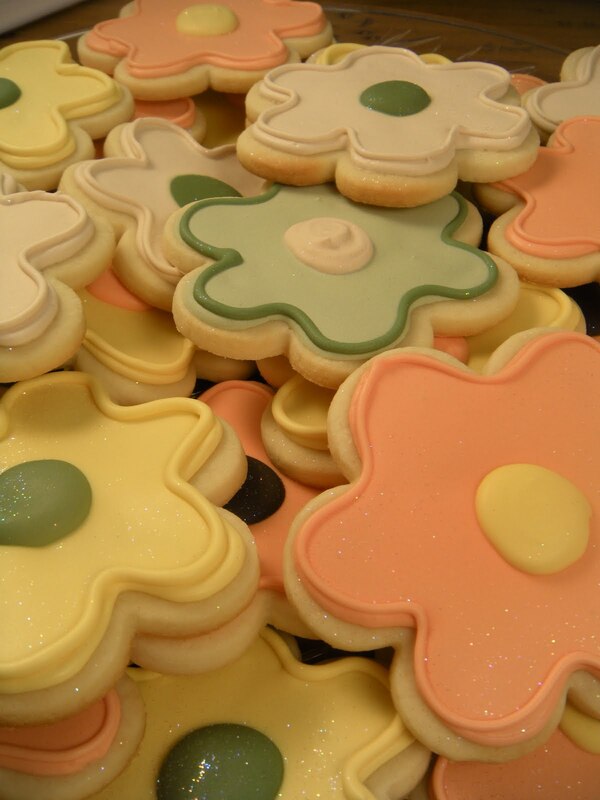 Lilaloa is an amazing sugar cookie baker. Her trademark is chocolate dough which I have mentioned before. The contrast of the chocolate with the royal icing is stunning. She puts it all out there, tutorials, tips, recipes, the whole package. She is a generous artist, because not everyone shares their tricks. I don't really have any, although one day I will put my own tutorial out there because I am also pretty specific about things. But trust me, nothing earth shattering, and I do a good job on cookies, but Lilaloa is a cookie artiste! So a week or so ago, she started posting Halloween ideas, and her great idea was to take her already fabulous chocolate dough and drop some black in it for the perfect black cookies. I knew I had to try this. Last weekend was the opening weekend for college volleyball, and our team is black, purple and white. I am certain you know where I went with this. All I could see in my mind was purple disco dust on those black cookies. So I went to town. I did the M, the sword and some rounds. I had ONE day to mix, chill, roll, bake and ice. It was definitely a last minute decision, not full of precision. But a team of volleyball players don't really care too much about your royal icing being too thin and bleeding. Really, no one even mentioned it. I made her recipe for End-All Chocolate Cookies and this time I used the shortening. The last time I made this recipe, I opted not to. I probably should have done all butter, because thanks to Tropical Storm Will, the air in Southern Mississippi was a little soggy, and the shortening has a tendency to keep the cookies softer. But this dough rolls fantastic and holds its shape during baking. The M cookies however were too soft and tended to break. Again, no one seemed to mind! I went with the purple and black and white. A little black and purple disco dust, some black coarse sugar, a few polka dots. What's not to love here. It was a great weekend, good volleyball, a very nice group of parents and players. Looking forward to a fun season and many more cookies. What are you waiting for!